We can take your new project from the start of the design: including the drilling, perk testing, permitting all the way through the installation, start up and final. We work with the local engineers and are very familiar with the new codes and requirements that are always changing. Js has constructed large waste water treatment projects in the Malibu area including the new Trancas market system, Paradise cove systems, Pavilions market up at heather cliff, Dukes of Malibu and several more. We have installed countless residential systems from small conventional systems to sophisticated water treatment systems. We are familiar with and have installed most systems (Orenco, Enviro server, Septitech, Jet, geo flow) that are approved in our service area. Js does everything in house from excavating, shoring, dewatering, plumbing, Electrical and concrete work. We can take care of a project from start to finish. 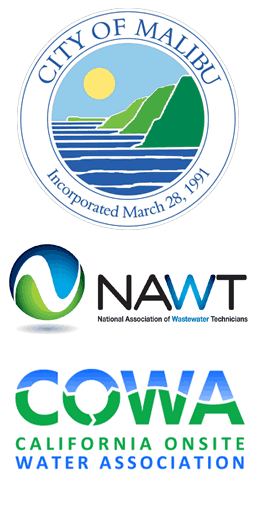 JS is certified by the city of Malibu, NAWT and has been a member of COWA for years. Our employees are certified by Orenco, NAWT and continue their training every year to keep up with our fast-changing industry.